South Bay Movers – Discount South Florida Movers knows how difficult moving can be on you. That’s why our experts can work with you every step of the way to ensure that your move is easy. We have been helping people with all of their moving needs for over fifteen years now. Let us do the heavy lifting for you. We put our customers first and guarantee that you will be satisfied with you move. We offer a wide array of services to help you with all your moving needs. We can provide high quality packing materials and even securely pack your belongings if you need us to. Our team of experts can prep and move your piano, artwork, or antique safely and securely. Call us today and let us know what we can do for you. We will give you a free quote and show you our low rates. South Bay is located on the southern shore of Lake Okeechobee. This city of 4,500 is the westernmost incorporated municipality in South Florida. It was first incorporated in 1941. Even though the surrounding area has 54,000 people, it is one of the few incorporated areas in its section of Palm Beach County. It is surrounded on all sides by unincorporated territory. This diverse city is made up of two thirds African American and twenty percent Hispanic. The city also serves as the intersection of East-West 80 and US 27 which runs north and south. Economically, the per capita income is $9,126. This is driven by the high percentage of residents under the age of eighteen which are 27% of the population. 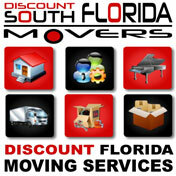 Discount South Florida and South Bay movers provide low rates on residential, commercial, piano and long distance moving.